As the battle over medical marijuana continues to be slugged out in court case after court case in California, our Los Angeles marijuana lawyers understand a quiet groundswell of support has been brewing in Congress. Now, it appears we may be close to seeing some real action. Democrats in Oregon and Colorado are planning to introduce two separate bills that, if passed, would drastically alter the way the government defines marijuana and limit the scope of power federal prosecutors have in aggressively going after dispensary owners and landlords. Of course, we recognize this is far from the first time bills relating to marijuana reform have been brought. However, this action comes at a pivotal time in our history and collective national conscience. We now have 18 states and the District of Columbia that allow marijuana use for medicinal purposes, and another two that have decriminalized recreational use, possession and sales. It could still be a long-shot, as several government analysts are predicting, but the arguments made by both Representatives are quite convincing. One of the measures set to be proposed was drafted by Rep. Earl Blumenauer, D-Or. The Marijuana Tax Equity Act would set up tax guidelines for marijuana, similar to what we see now with alcohol and tobacco. In it, the “first sale” of the plant, that is, from the growers to either processors or directly to retails, would require payment of a 50 percent federal excise tax, or those we pay for certain goods, like gas. Producers of marijuana would also be taxed a flat rate of $1,000 a year, while retailers would have to pay a $500 annual fee. Blumenauer asserts the goal is to help reduce the national deficit, as well as provide funding for drug treatment programs and law enforcement officials (who would subsequently be freed from having to spend significant resources tracking down petty drug crime offenders). He estimates that conservatively, his plan could rake in $100 billion in a decade. Meanwhile, the second bill was drafted by Rep. Jared Polis, D-Co. The Ending Federal Marijuana Prohibition Act would basically do just that at the federal level. States would not be forced to legalize marijuana, but those that do could work to establish an effective framework for regulation without having to worry about the federal government interjecting with criminal charges, liens or fines. It would also strip the U.S. Drug Enforcement Administration of marijuana regulatory power, handing it over instead to a newly-renamed Bureau of Alcohol, Tobacco, Marijuana and Firearms. Polis was quoted in TIME Magazine as saying Americans recognize that the war on drugs has failed and substance abuse must be treated as a health issue, rather than a criminal matter. A national Gallup poll conducted last fall revealed that more than half of all Americans believe recreational marijuana use should not be a criminal offense. 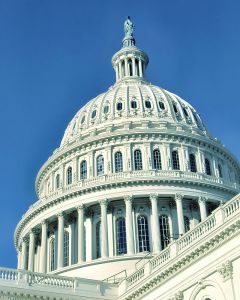 In addition to these actions, Senate Judiciary Chairman Patrick Leahy, D-Vt. expressed his intention to hold hearings on how to approach the inherent conflict between federal and state cannabis laws. Also, our own Rep. Dana Rohrabacher, D-Calif., has hinted at the introduction of a bill to give states sole regulatory authority on marijuana. It’s not expected to end there. Blumenauer said he anticipates up to 10 marijuana-related bills to be introduced this year.